Jennifer Watkins has been an active member of the Junior League since 2011. Jenn joined the Junior League in to meet like-minded women and give back to her community and was surprised to also gain invaluable skills through the various trainings offered by the League. She began her League membership with the Junior League of Santa Barbara and transferred in 2014 to the Junior League or Orange County, California. Jenn’s placement over the years include: chair of the Franklin Library Renovation Project, chair of the American Girl Fashion Show, Festival of Trees, Public Affairs External Advocacy Liaison, Secretary for the Board of Directors (JLSB and JLOCC), Operations Manager for The Christmas Company, and President-Elect. Developing the leadership potential of women is her biggest passion. 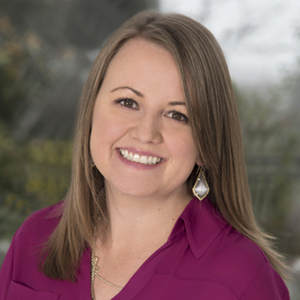 Jenn holds a Master of Public Administration and Leadership degree from California State University Northridge and a Bachelor’s degree in both Law and Society and Art History from University of California Santa Barbara. She puts her League training to work in various roles impacting the community and spends a lot of her free time alongside her husband, Chris, in junior high ministry. Born in Germany and raised in Southern California, Jenn cannot imagine living anywhere where “sunshine” is not a season. In her spare time, she enjoys hanging out with her amazing husband and their son, Asher, weekend getaways, taking naps, and attempting to expand her Deutsch vocabulary beyond ten words.